Precautionary Pre-Flight Tips To Remember | Executive Flyers, Inc.
At Executive Flyers Club at Sacramento Executive Airport, we want to emphasize that experience is no substitution for maintaining diligence in pre-flight safety checks. When it comes to flying, making sure even the little details of a pre-flight safety are done correctly can affect the safety and pleasure of your flight or that of the next pilot. Whether you own your own plane or rent, take no shortcuts in your pre-flight. 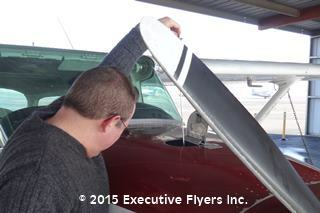 It doesn’t matter if you think you “know” your plane or are renting club aircraft, be detail oriented! – Oil on the engine increases fire hazards and could migrate to windscreen and impede crucial visibility. – Using the wrong rag to clean windows could hinder visibility in flight. – Blue sheets are important to advise us of necessary aircraft maintenance or supply needs. – You want to fly, we want to make sure planes are prepared and safe. Squawk away! 6. Heals to the floor unless braking for turn or stopping. Otherwise, don’t ride the brakes. – Use this as a mantra: “Keep your heels on the floor unless you are braking for landing, or parking!” Period. At times of high workload, if you lift those feet up, you will press brakes without realizing it. In general, It is very important to treat these planes like they are your own. Repairs are very expensive.